Big in to small batch brewing. Small batch home-brewer, Mark Robinson, has come full circle on his brewing. 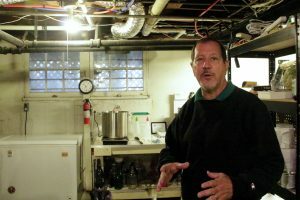 We brewed a nice Bock style beer with Mark at his brew table in the basement of his Highlands home and talked about his return to brewing one to 2-1/2 gallon batches of home-brew. Like many brewers, Mark started on the stove top follow instructions (BEER CRAFT). He worked his way up to an elaborate “brew system” with all the pumps and tubes. 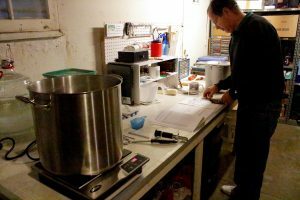 Mark believes small batch brewing gives him greater flexibility to brew more beers. More importantly, he can brew better beers with less work. The results speak for themselves. 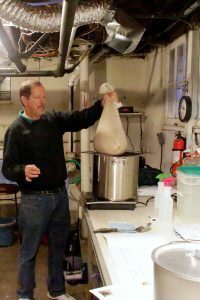 One of Mark’s small batch beer recipes will be the featured brew at the 2016 Tailspin Ale Festival. More about that later, but now listen to Mark’s thoughts on brewing small.